Yarta, S. Y.k 357 tons. The Right Hon. Arnold Morley. 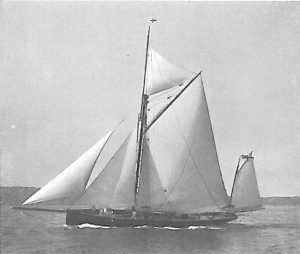 Alruna, Yawl, 126 tons. The Right Hon. John Sinclair. two years for the Emperor’s Cup. In the autumn of 1885 he accompanied Mr. and Mrs. Gladstone on their Baltic trip in the Sunbeam. Clubs: Royal Yacht Squadron, Royal Harwich. Residence: 7, Stratton Street, Piccadilly.